It seems I've had a long glass hiatus, but the cooler weather has made working around a torch and kiln more appealing. This week I finally reconnected everything and spent a few hours trying new ideas. Of course, I made a few of what I consider my warm-up beads, to regain some semblance of glass control. It was over a month since Al's class with NO torch time, so the control is slow to return. 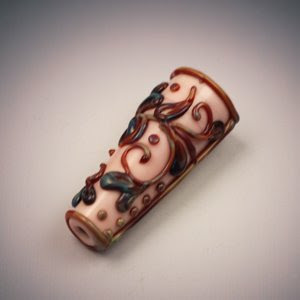 This bead uses the new Double Helix Pandora, which changes color in the kiln from a pale caramel to various blues and violets. Tomorrow, depending on luck, I head to the Cayman Islands for a week of relaxation. Of course, that depends upon a small hurricane named Paloma!